How walkable is your Barrio? 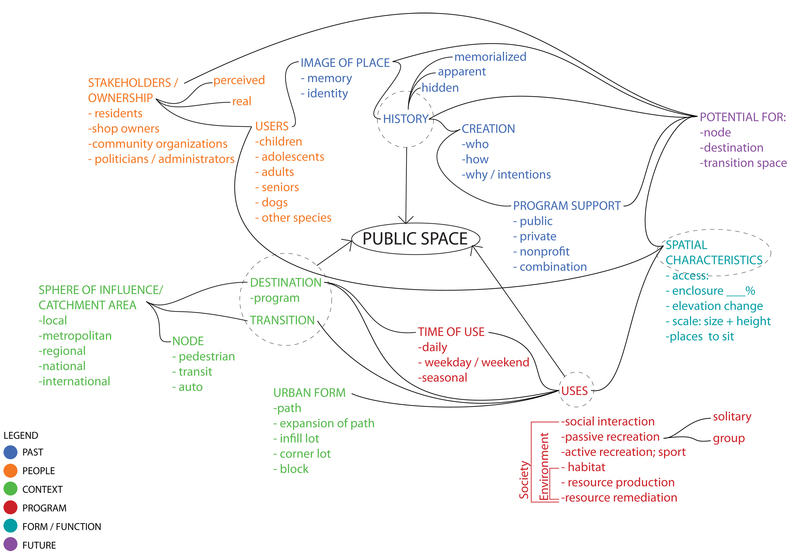 The above diagram is a beginning to understand the relationships between the varied tangible and intangible elements of Public Space. 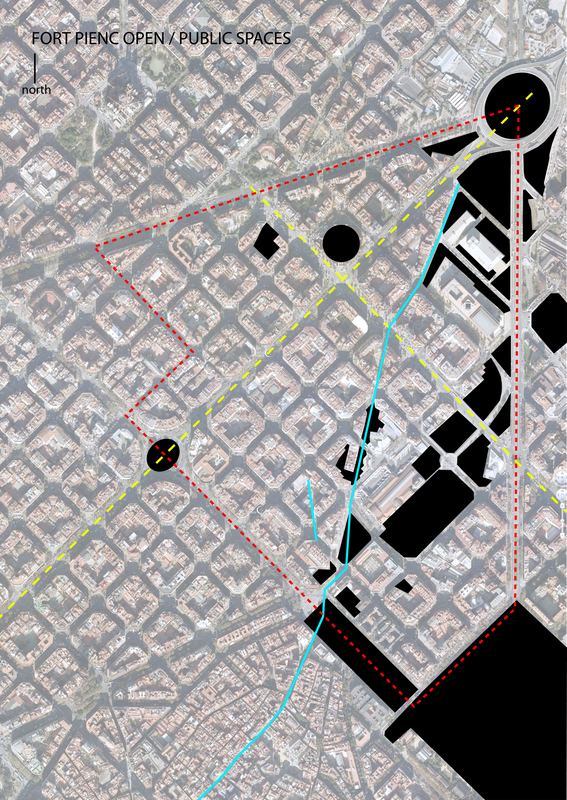 The explicit elements related in the diagram will be used to analyze the public spaces in Fort Pienc. 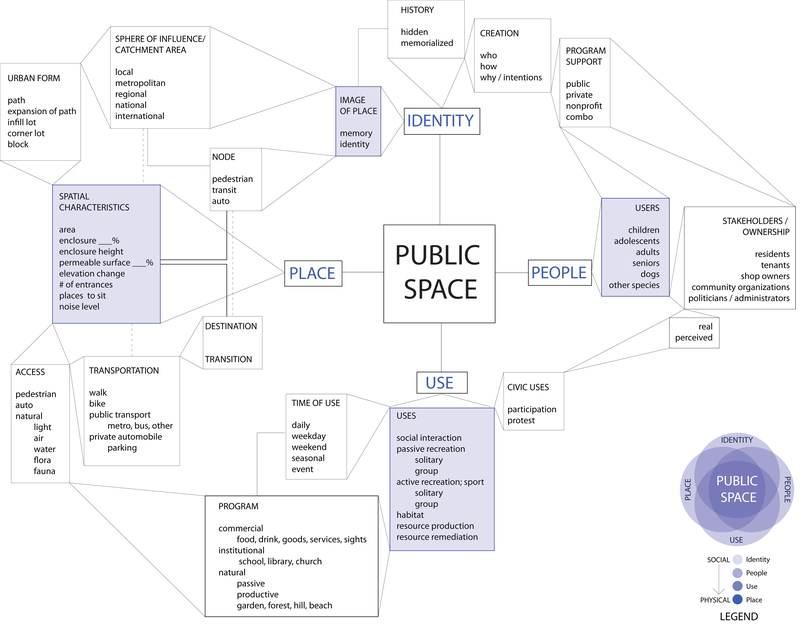 Public Space (read: social, civic, democratic) is not easy to grasp, create, or sustain. At its best, it is implicitly pluralistic, rendering it inherently complex. Participation is a similarly slippery term, especially since it has become diluted by over ab/use. The group Raons Publiques demonstrates an explorative, earnest practice in both Public Space and Participation. In many ways, you cannot have Public Space without Participation as Richard Rogers notes: The only way forward, if we are going to improve the quality of the environment, is to get everybody involved. PAST: A study into the origins of public spaces in Fort Pienc. PRESENT: An analysis of the area around the Field Work (Diagnostic) to determine current networks and flows of the urban condition, to elucidate the best types of future uses. The analysis will consist of documentation and mapping. 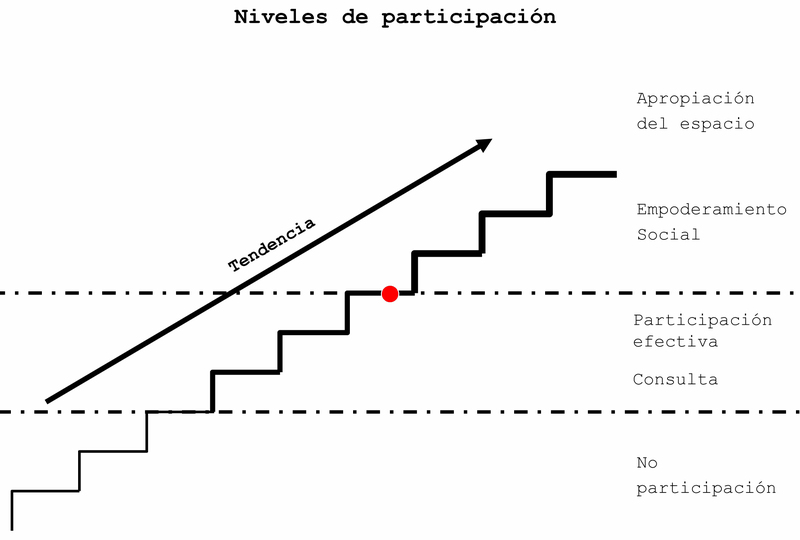 PARTICIPATION: A study of other Projects of Participation in BCN to determine the level and result of the claimed participation. 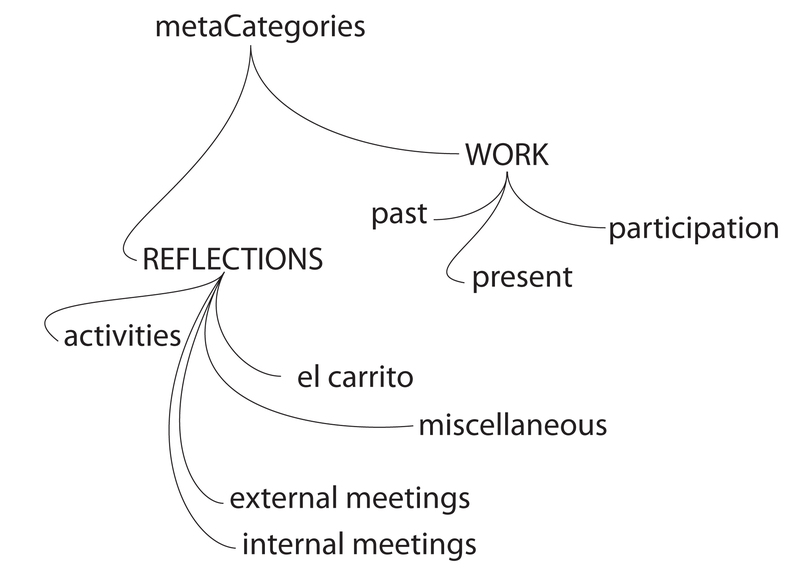 A study of participatory processes linked to Public Space in Fort Pienc. In analyzing Processes of Participation, I will borrow from the philosophy for levels of participation as conceived by Raons Publiques. The level of study in each of these categories is still open, and only time will tell the depth and breadth of research undertaken. This is the groundwork for innovation. Civic activism, observation and a dialogue are all needed for change. Public Space (social, civic, democratic) is such a diluted term that it fails to communicate with precision. In many ways, I cannot say what Public Space is, only what it is not: Private Property. Of course, upon closer inspection this also fails, since plenty of public events of social interaction occur in privately-owned spaces transformed into Public Space for certain periods of time or events, like a dinner party or an outing to the movies. And then there are the private enterprises, such as cafes and restaurants that contribute social interaction to a space otherwise lacking such activity; blighted public space can hardly be considered social. And so there is a complicated dialogue between public, private and all spaces in between.